Throughout history those with mental health problems have been depicted as ‘other’, thus distancing them from the general population. At Glenside Hospital Museum in Bristol, we are very lucky to have unique collection of photographs, paintings and drawings of the patients and the environment of the Bristol Lunatic Asylum which later became Glenside Hospital. They are valuable both as works of art and as evidence of the history of a mental health hospital from 1861-1994, but more than that, these diverse images are testaments to the humanity of those who resided in the asylum. They are not ‘other’ they are us. What is extraordinary is their lives and their stories have, more often than not, been hidden. Inadvertently the 100 year patient confidentiality legislation, combined with many families not wishing to acknowledge poor mental health in their history has ensured they remain hidden. We can now examine the files of over five thousand patients who were given refuge and hospital treatment in Bristol Lunatic Asylum from 1861-1916. Their stories are held by Bristol Archives https://www.bristolmuseums.org.uk/bristol-archives/ and Dr Paul Tobia has put together a comprehensive database of 5111 patients. 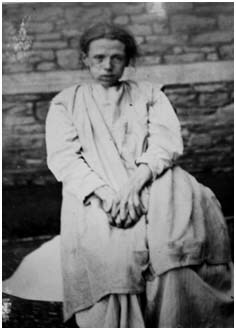 Included are 700 photographic portraits of the patients mostly taken shortly after their admission in the 1890s. These remarkable pictures bring to life a forgotten group of people. Through extensive research we have discovered some of the stories of the people behind these photographs: deep depressions, chronic ill-health, bizarre delusions and blighted love affairs. Many of the stories are tragic but others show recovery and are a testament to the human spirit. Some 48% are discharged, 70% within the year, but others remained with untreatable conditions dying shortly after admission or to remain as residents in the hospital all their lives. Find out why Harriett Abbott below looks so ill.
Dennis Reed was an accomplished artist who was a patient in the 1950’s. Whilst there he produced many fine works showing life in the asylum. They are a contrast to the photographs in that they were produced by a patient and emit an empathy that is lacking from the photographs. Do they tell us the same thing? If they have a message, is it that in forming a better understanding of these people we can acknowledge that although human experience is very diverse it is still human, the ‘other’ does not exist?